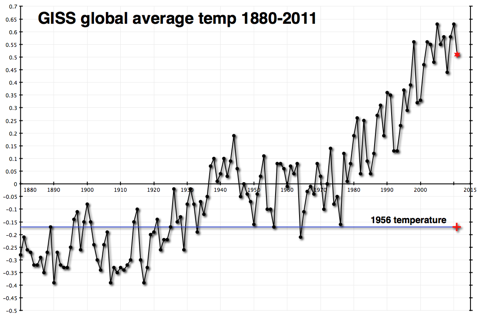 ENSO does have an effect on global temperature — that’s been understood since the 1970s, if not earlier. 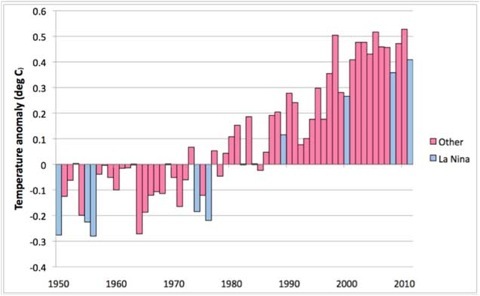 La NiÃ±a years tend to be cooler than the years around them, as this WMO graph illustrates. It’s clear that even cool La NiÃ±a years have been warming, with 2011 being the warmest such year in the instrumental record. In order to make his unphysical forecast, McLean must have forgotten what he had done in the paper he was so keen to promote. I could perhaps be forgiven for suspecting that he didn’t know what he was doing in the first place — but then that just makes his co-authors, Chris de Freitas and Bob Carter look equally daft. They certainly didn’t rush to correct McLean’s folly. As ever, in the land of the Climate Cluelessâ„¢, anything goes.